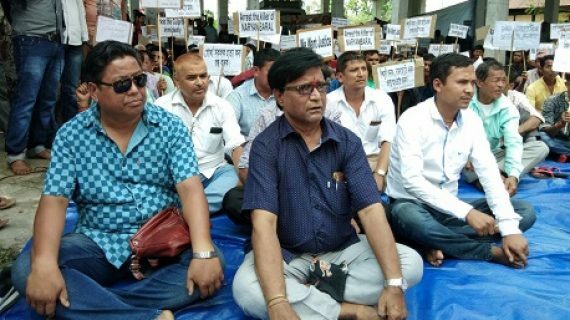 The All Assam Gorkha Students’ Union (AAGSU), Assam Gorkha Sammelan & Nepali Sahitya Sabha Kokrajhar District Committee jointly organized three-hour sit-in demonstration in front of the Deputy Commissioner, Kokrajhar on Saturday at Kokrajhar. They jointly demanded immediate arrest of the actual culprits behind the killing of late Narayan Baral, who was an excise official and sufficient compensation for the family members of Narayan Baral from State Government as well as BTC Government. Thousands of AAGSU activists and locals with placards and festoons shouted slogans like ‘Killers of Baral’s should be arrested’, ‘Culprits must be punished’ and participated in the dharna which started from 11 am. A memorandum, addressed to Chief Minister Sarbananda Sonowal, was submitted to the Kokrajhar Deputy Commissioner, to fulfil their demands. He said, the Gorkhas have been living peacefully in Kokrajhar district as well as across Assam since time immemorial. “But it’s a matter of great regret that our people have been brutally killed by unidentified miscreants time and again, starting from 1980s and it is continuing till date. Neither any development has taken place in any of such cases nor any culprit behind such killings has been arrested,” said Chetry. Narayan Baral, an inhabitant of Saralpara forest village in Kokrajhar, was killed on May 2, 2018 at 7 No Ride near Ultapani forest village while he was returning from his NRC duty at Magurmari near Kokrajhar town. Narayan Baral, who is survived by two children and his wife, is the son of late Tikaram Baral, who was also killed by unidentified miscreants way back in 2003. Narayan Baral served as a Sub-Inspector in the Excise Department and was supposed to take over as the charge of Inspector.